I’ve wasted far too much time. Ever since I slayed my first cockroach as a kid, I knew I wanted to hunt monsters. The thrill of approaching something dangerous, the strategy and preparation, the intense skill of combat, they all made me feel alive. I was tired of my safe life in the forest eating tree bark. With nothing to do, I strolled into the nearest town and caught wind of a place called Bhernha Village on the notice board. They were looking for hunters to help with their research, and it felt like this was my calling. After a long trek I had arrived at Bherna Village. Out of breath and bewildered, I stood at the entrance and took in my new surroundings. This whole area was quite a treat on the eyes, very vibrant and colourful. The air felt calm and welcoming. The village itself was a lot smaller than I expected, but it seemed like they had everything they needed. There was an armory, quest board, house, and a bench to eat. I guess all the fun stuff was outside. I approached the chief and introduced myself. He seemed like a nice old fellow and was impressed with how far I had traveled. I expected this place to be crawling with hunters but it seemed like they were in short supply. Everyone sounded grateful I had arrived. The chief gave me a brief rundown of their facilities and even gave me a house to sleep. My days of sleeping on dirt were finally over. 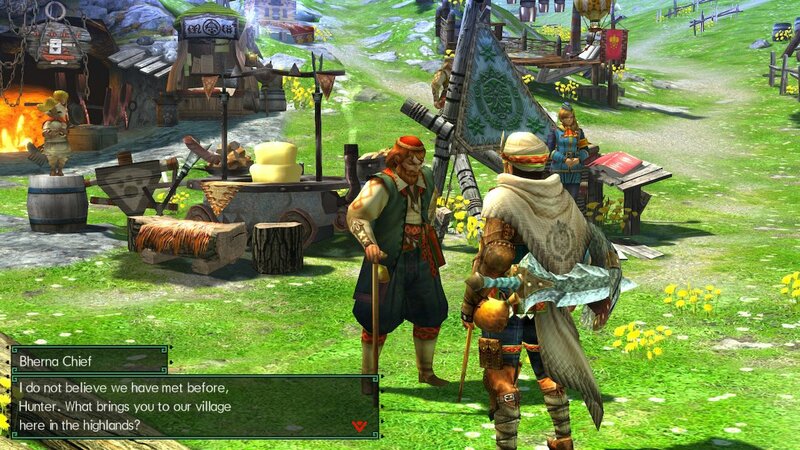 I walked around town a bit and met some of the villagers, they seemed polite. One muttered something about things disappearing in the sky but I didn’t quite understand. Probably high on something, I noticed quite a few different plants around here I had never seen before. I then met the chief researcher of the Wycademy. 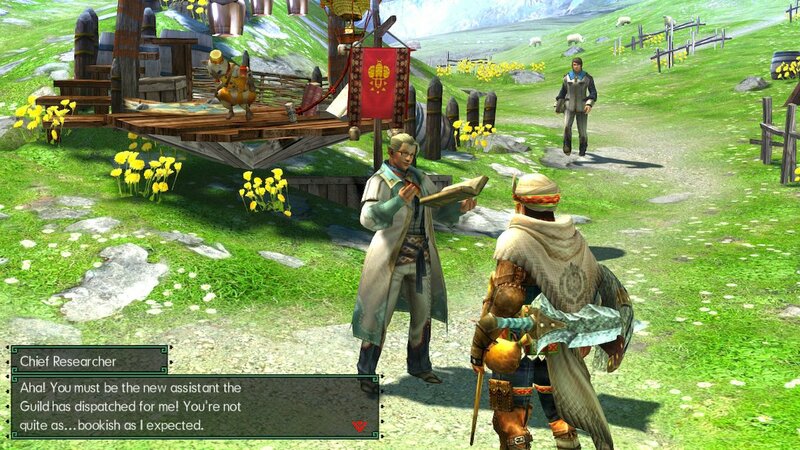 He told me about what they do, researching the area and studying monsters, blah blah blah. I was just here to hunt but it’s nice to have a reason, I suppose. Okay, enough chitchat. 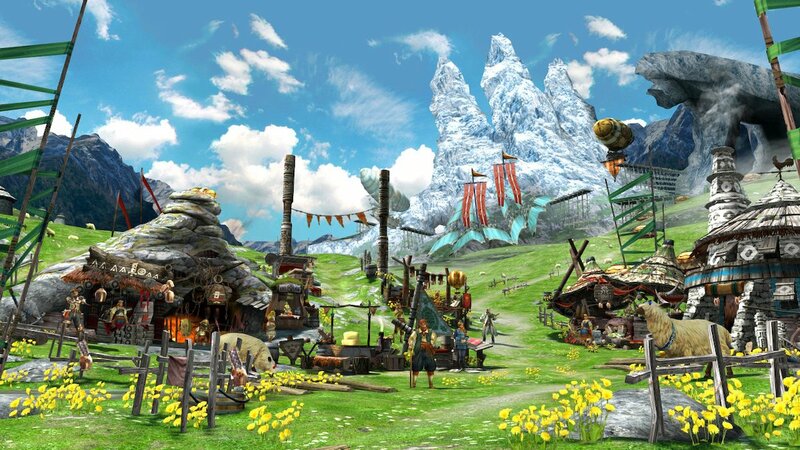 The quest counter in the middle of the village was now available to me, with a lovely PR girl in charge of operations. She was nice but didn’t seem to like her job that much. Her eyes sparkled when talking about the potential of the village, however. Things were quiet at the moment, but I was ready to do my best. I had a glance at the quests and it seemed like I was limited to easy ones until I got my rank up. Fair enough, I have to prove myself first. These weren’t even hunting quests, they were gathering ones. Picking flowers? Anyone can do that. To make up for my disappointment I picked the most extreme gathering quest I could find. 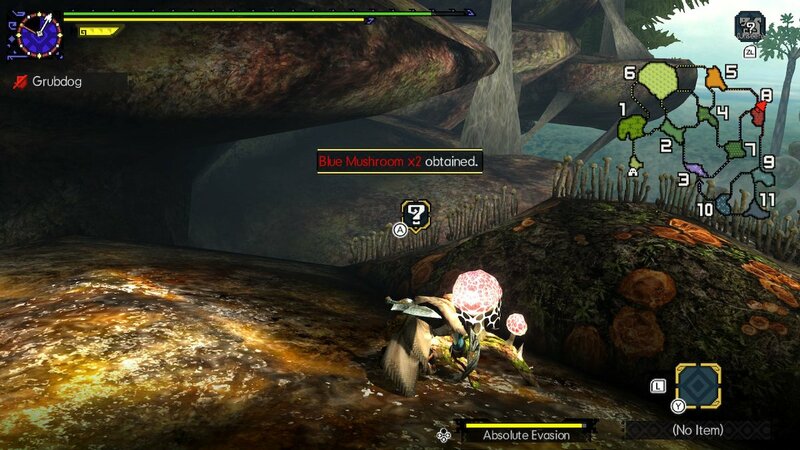 “Abyssal Mushrooms”, these sound pretty rare and exciting. 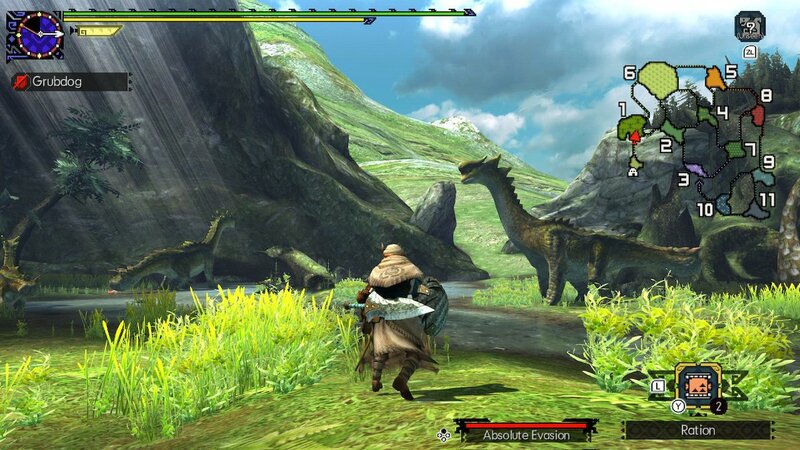 I went out the quest gate and headed right towards the first hunting area, the Jurassic Frontier. WOW! I had never seen creatures this big walking around so casually before. Are they gonna attack me? … They seemed friendly. One walked right past me with indifference and I calmed down a bit. It started eating grass and I realised they were herbivores, just getting on with their day. Ok, time to focus on the quest. I had 50 minutes to get 5 abyssal mushrooms. How hard can that be? With such a generous timeframe I felt like I could afford to relax and get my bearings first. This place looked different to what I imagined. All my life I had only heard second-hand reports of places where monsters roam delivered in grainy parchment, but the crispness here was evident. I felt a sharp sense of clarity as my eyes scanned the horizon at 60fps. Looking around, there was a lot more detail than the top half of a folded parchment could capture. I couldn’t just see it now, I could feel it. The wind whispered and the sky was moving. Light cascaded through gaps in the trees and the water glistened in response. This place was real and wholesome. I started gathering everything I could find just to get used to the whole process. A couple of ferns, herbs and stones. They fit in my pouch quite nicely. After just a few minutes I found some mushrooms I could harvest. YES! Let’s see… blue mushroom, unique mushroom, toadstool. I found a lot of different mushrooms but no sign of abyssal ones. Hmm. Maybe it was luck, or maybe they were only in a certain spot? Time to think. Why were they called abyssal mushrooms? I was quite high up and this was the opposite of an “abyss”, really. There were some lower parts of the map I hadn’t explored yet. If this mushroom lived up to its name, it had to be there. I headed downwards with an optimistic view of Area 9. AHA! 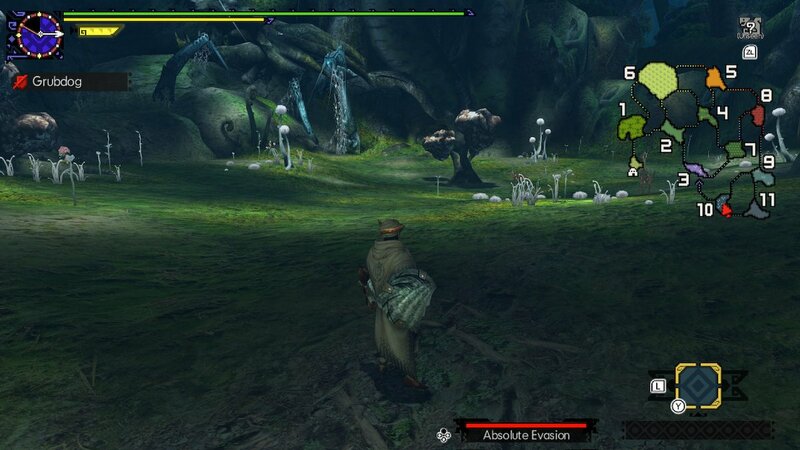 I finally found some abyssal mushrooms but now my item pouch was too full from finding other stuff. I had to look through for something to throw out, but hey.. wait.. what? Oh you sneaky little bugger! GIVE THAT BACK! Some felines had snuck up behind me as I was picking mushrooms and one stole my map. After coming all the way to the far depths of the Jurassic Frontier I felt naked without it. All I had was a faint outline and my peripheral vision was suddenly more blurry. Experienced hunters might not have a problem getting back but I was still finding my way around. I had no choice but to chase down the feline creatures and make sure they didn’t steal more of my stuff. 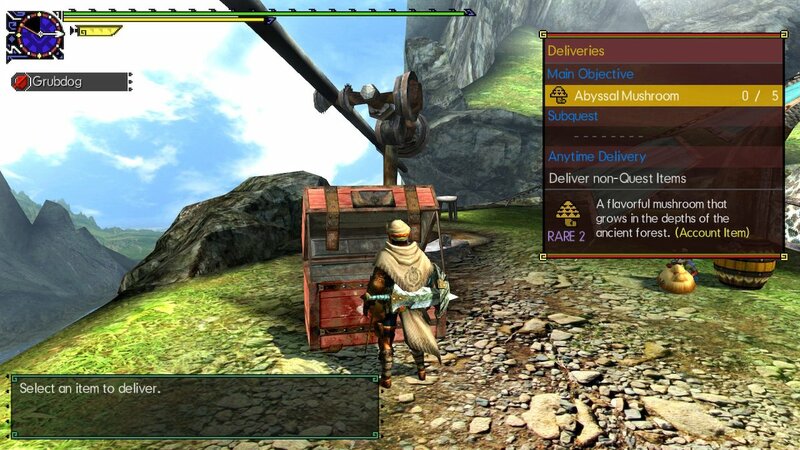 I mashed my standard weapon attack a few times and they scampered off underground. Phew, there’s my map. That wasn’t too difficult but a slight scare. It looked like they were gone so I went back to the mushrooms. One, two, three abyssal mushrooms. Hm, I needed five to complete the quest but that was it. Time to look in the next area. My stamina had dropped a bit and I felt weaker, so I had one of my rations. It tasted a bit chewy but I felt better. This new area felt strange though. The flora was quite surreal, like I was on another planet. I looked around and didn’t see any mushrooms I could harvest. Some bones, more herbs. With my pouch full now, all I cared about were the quest items. I snuck a bit closer to a large mushroomy rock and discovered I could pick some live ones at the base. YES! More abyssal mushrooms, I finally had five. Time to go bac- OH NO! Hiss! I felt a sharp scratch on my neck and turned around in shock. Three aggressive bird-like creatures were hopping around on two legs sizing me up. I swung my sword in a panic but missed, damn it! These guys are fast. One lunged towards me and I rolled to the side. That was a bit clumsy but at least I didn’t get hit again. Now I had to scramble back up and focus. They seemed vulnerable right after their lunge so I got in a few sword hits. BAM! One fell to the ground after a couple more. I got scratched again but finally managed to fell the other two. Phew, I think I’m okay now. One more suddenly jumped out of a crack in the foliage. I took my sword back out and… no… I’m getting out of here. I sheathed my weapon and started running. I didn’t want to fail my first quest. There was no telling how many of these creatures were waiting. I found my way back to base camp fairly easily with the map, stopping only to refill stamina. 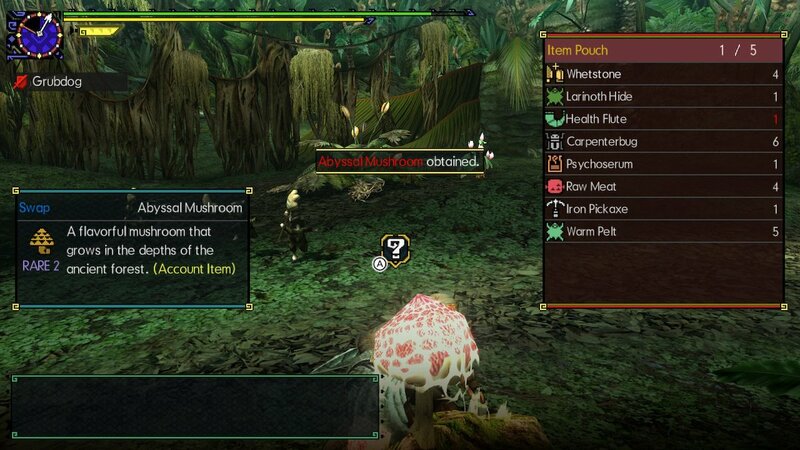 I put the mushrooms in the box and the quest was done. Not quite a hunt, but still an adventure. What seemed like a simple task was made interesting by the fact that I had no idea what I was doing. I felt proud that I still came back with something. I used to be intimidated by the unknown, but for the moment I was enjoying it. I needed it. My mind buzzed with all the potential challenges that awaited me in this brave new world. If I was caught off guard by common monsters, what would happen with a big one? I still didn’t really know how to fight or what to expect. I will just do my best and learn as I go. 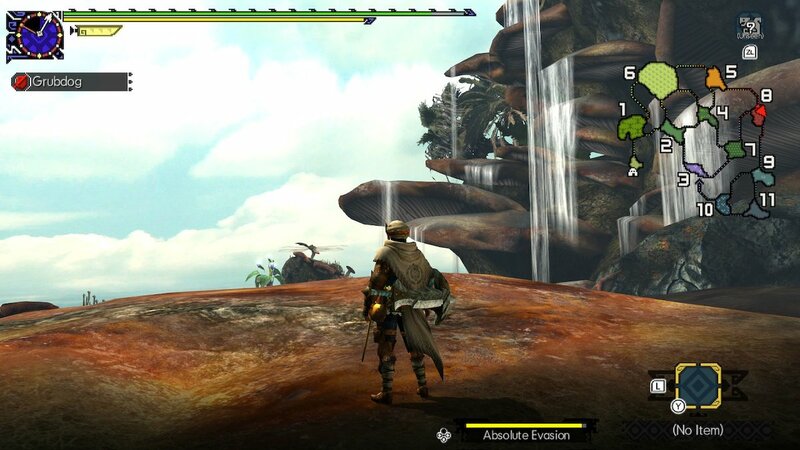 I am a Monster Hunter now. 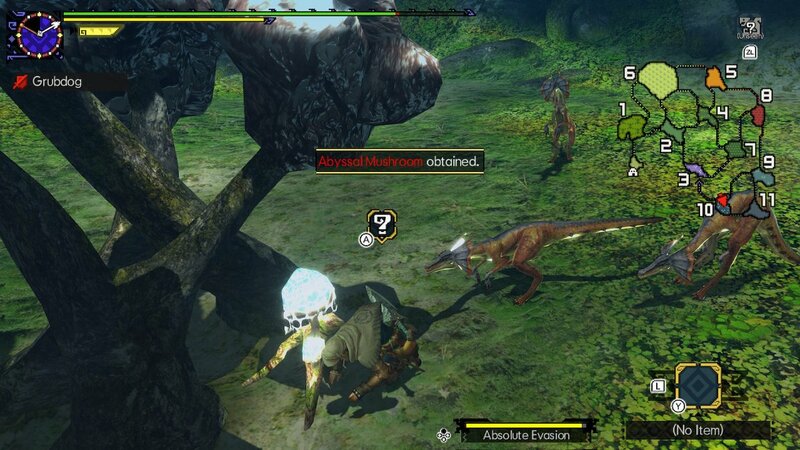 This entry was posted in Uncategorized and tagged Monster Hunter, Monster Hunter Generations Ultimate, Nintendo Switch. Bookmark the permalink.